Sago Pudding. (Ellen Eastman) Soak 4 table spoons of sago in 1/2 pint of water over night - in the morning cook for a few minutes with 1 pint of milk - 1/2 cup sugar, the yolks of 3 eggs a little salt and flavoring as you please Before wanted for the table, beat the whites of the eggs with a little sugar, spread over the top and let it brown, add currant jelly in spots the last thing. 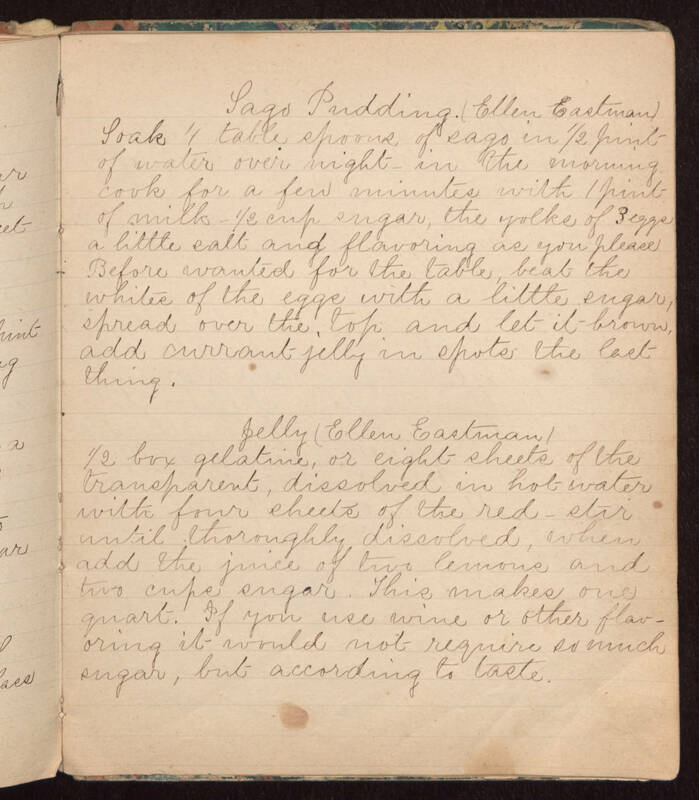 Jelly (Ellen Eastman) 1/2 box gelatine, or eight sheets of the transparent, dissolved in hot water with four sheets of the red - stir until thoroughly dissolved, when add the juice of two lemons and two cups sugar. This makes one quart. If you use wine or other flavoring it would not require so much sugar, but according to taste.